Anglers fishing the Gunpowder river have experienced low and clear water throughout the catch and release section. At Falls road the river is flowing at 35cfs and water temperatures are in the 50 to 55 degree range. At Glencoe road the river is flowing at 75cfs and water temperatures are around 60 degrees. 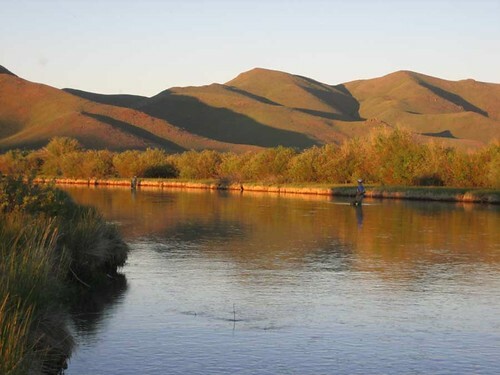 Stealth and a careful approach is absolutely necessary when fishing in these low flow conditions. Ten to twelve foot leaders tapered to 6x and 7x have been the ticket. We have seen lots of cream and black bodied midges throughout the mornings. The browns have been keying in on size #20-24 griffiths gnats and I-Can-See-It midges. Small tan and brown bodied caddis have been hatching throughout the middle hours of the day. A size #18 tan elk hair caddis has been producing lots of fish throughout the riffles and moving water. Keep an eye out for trico mayflies as they will soon start hatching out in the mornings throughout the catch and release section. Terrestrials such as ants, beetles, hoppers, and crickets have been enticing takes during the heat of the day. A size # 16 black bodied parachute ant fished close to the bank in the shade is a great way to fool trout. Nymphing has also been productive in the deeper holes and bends. A size #14 to 16 bead head micro mayfly nymph with a size # 22 black zebra midge dropper has been very effective. Anglers looking for more water should fish below Blue Mont road and the confluence of Little Falls. Swinging larger wooly buggers and zonkers along the banks and log jams has moved some nice fish. 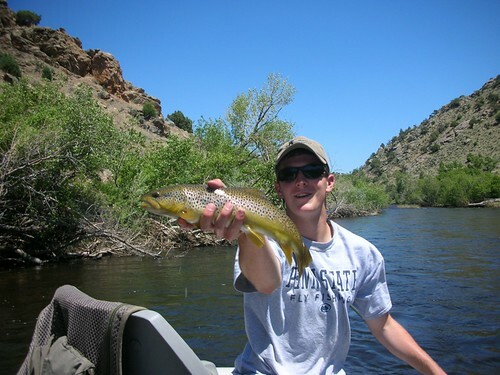 This entry was posted in fishing report on July 1, 2010 by Alex McCrickard. The fishing on the Gunpowder has been productive in the past week. Anglers fishing in the mornings can expect to see fish sipping tricos in the flats and tailouts of riffles. With the weekday flows at 30cfs, the fishing has been technical. A stealthy approach is necessary in order to catch these finicky fish-12 foot 7x leaders are an absolute must for fishing these tiny flies. The water temperature is still in the mid 50s. With hot humid days in the upper 90s, alot of fisherman have been wet wading. When fishing the trico hatch, its important to correctly match the hatch. 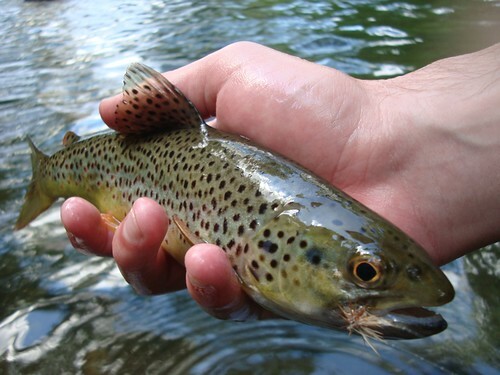 The fish generally start sipping emergers and duns in the beginning of the hatch. Towards the end of the hatch, the fish are almost entirely feeding on spinners. The hatch has been fairly prolific from the middle to upper sections of the catch and release water. Depending on the day, the hatch can start as early as 8 AM and end as late as 1 PM. I like to get to the river early and nymph for an hour or so before the hatch gets going. A size # 16 bead head hares ear nymph with a size # 20 or 22 pheasant tail dropper has picked up lots of fish. 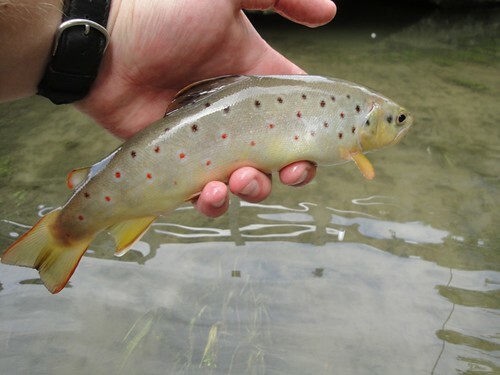 You’ll find most of the browns will fall for the smaller pheasant tail dropper which imitates a trico nymph. Small black zebra midges and WD 40s in size 22 have also been producing. During the hatch, black RS2’s and Mike Bachkosky’s trico dun patterns are my go to flies. Later in the day, it’s best to fish terrestrials such as ants and beetles through riffles and tight to the banks. Hoppers have been moving lots of fish for me lately. In the deeper pools I like to really splat the water in order to gain the fish’s attention. Greenie weenies and san juan worms are also effective flies this time of the year. Stay patient on the water and be ready for picky fish. A lot of the fish I have caught lately have refused the first three patterns I’ve tried. It takes skill to fool these fish and a lot of times all they need to see is something a little different. This entry was posted in fishing report on August 12, 2009 by Alex McCrickard. I recently spent a week fly fishing the North Platte River and its tributaries at A Bar A Ranch just outside Encampment, Wyoming. My family and I spend a week there every summer and the fishing is fantastic, this trip being no exception. When we arrived, recent rains had muddied the North Platte, which was running near 1600 CFS. Throughout the week the river dropped and cleared to a flow of around 700 CFS, partially due to irrigation upstream. The Salmon fly hatch was practically over but large Golden Stones were out and about. Cream and Tan Caddis in sizes #14-18 hatched out in large numbers throughout the entire week. Large PMDs were sporadically hatching as well along with small BWOs in sizes # 20-26. 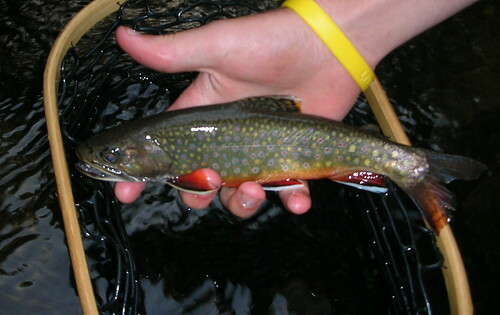 In the beginning of the week, large dark streamers and big Stonefly nymphs were the ticket with the off color water. 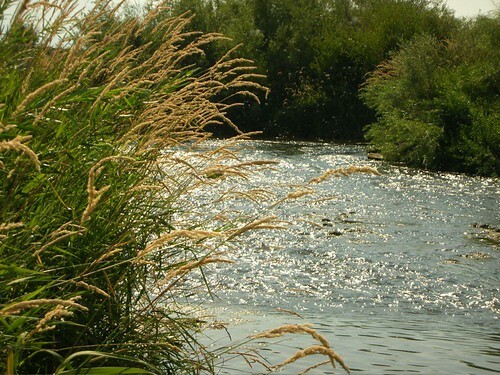 Occasionally hatching Caddis brought fish close to the banks creating dry fly opportunities. However these opportunities were limited with the stained water, so nymphing was the most effective technique. Large Golden Stonefly nymphs with small Hares Ear droppers picked up lots of fish. Kaufman’s Stonefly nymph and a pattern called the Wired Stone were killers throughout the week. In the beginning of the week I spent most of my time nymphing the tributaries to the Platte including a creek called Big Creek. Here large rainbows and browns readily pounced on size # 14 Pheasant tails and Prince nymphs fished deep on 4 and 5X. For some reason a bead head Red Copper John in sizes # 14-16 worked extremely well. As the Platte cleared throughout the week, the evening fishing was excellent as trout rose tight to the banks for Caddis and PMDs. These conditions often called for 5X and a size # 16 Cream Elk Hair Caddis or a size #14 PMD Comparadun. Grasshoppers and Crickets were just starting to appear in the beginning of the week but the fish weren’t quite keyed in on them yet. I took a few fish towards the end of the week on large foam Hoppers such as the BC Dropper Hopper and Tan Chernoyble Ants. A streamer known as the Thin Mint was incredibly affective along with a classic Zonker streamer in sizes # 6-8. A Silver Crystal Flash Wooly Bugger also accounted for many fish. Throughout the week we fooled lots of wild browns and rainbows averaging 14 inches long. Quite a few fish were in the 15 to 17 inch range. The largest fish of the trip included a rainbow and a brown of 21 and 20 inches respectively. As the summer continues, the fishing will only get better as large dry flies like Hoppers and Crickets will become more effective. The famous Trico hatch on the Platte is only a couple of weeks off as well. All in all the fishing was great and it was a treat to fish for these western trout. This entry was posted in fishing report, video on July 17, 2009 by Alex McCrickard. In mid-July I was lucky enough to spend an entire week in Wyoming. My family and I stayed at a ranch on the North Platte River just outside of Encampment, Wyoming. The North Platte was flowing high due to significant snow melt. The conditions were great and we were able float the river three times. Tackle and Techniques are slightly different out West in comparison to the East coast. We were mostly fishing with five and six weights where on the Gunpowder we typically use three and four weights. On larger water a larger rod is necessary. 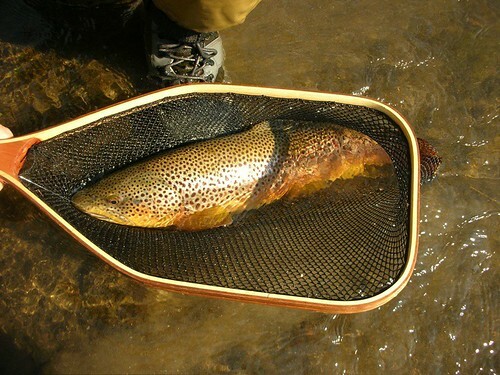 Big flies and large trout are easier to handle on a five weight rod rather than a three weight rod. I fished a nine foot Thomas and Thomas five weight matched with a Bauer M2SL for most of the week. My weight forward five weight SA Sharkskin line was perfect for shooting large hoppers to the banks of the Platte. We also used a Winston LT 8 foot 9 inch five piece, five weight rod. These pack rods are easy to travel with and are ideal for your next trip out west. Throughout the week, bug activity was tremendous. My Dad and I hit a prolific green drake hatch on the Encampment River one morning. On the Platte, pale morning duns in sizes #12-14 were coming off in the early hours of the day. The caddis hatch in the evening seemed to bring almost every fish in the river to the surface. The caddis were in sizes #12-20. If a size #12 elk hair caddis didn’t produce, than a smaller size #18 would get the job done. Many large and small stoneflies such as yellow sallies were abundant throughout the week. 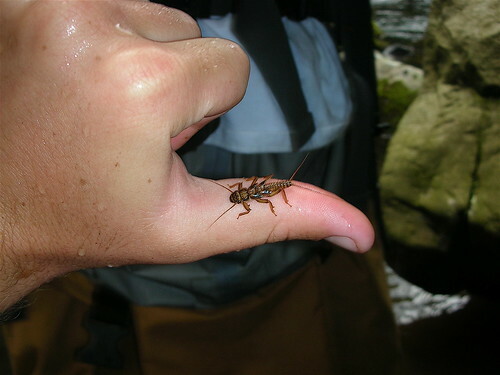 Each day I found large stonefly shucks in the size #4-6 range on boulders near the banks of the river. In between hatches I fished large hoppers tight to the bank. Some of the more productive patterns included the Rainy’s Grand Hopper, the Schroeders Hopper, and the Joe’s Hopper. Three and four-x leaders were as light as you could go when fishing large dries. A Copper John or Caddis Pupa dropper accounted for many of the fish we caught during the middle hours of the day. 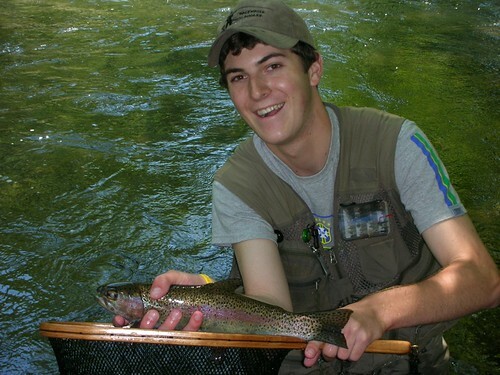 We landed many rainbows and browns in the 14-17 inch range throughout the week. My friend, Will Simmons, from Houston, Texas, was lucky enough to nymph up a 29 inch wild rainbow below the confluence of a large tributary on the Platte. It was easily the fish of the trip. Also note, a bigger net comes in handy for larger western fish. We carry a rubber mesh catch and release Wolf Moon net with a 15 inch handle and a 18 by 8.5 inch frame. All in all the fishing was superb! 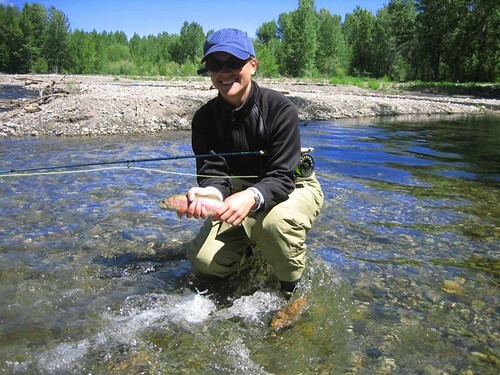 This entry was posted in fishing report, gear on August 7, 2008 by Alex McCrickard. Thanks to Christianna McCausland for the stream report, pics and kind words from Silver Creek, Idaho. Thought you all would appreciate that I had some good fishing in Idaho last week. 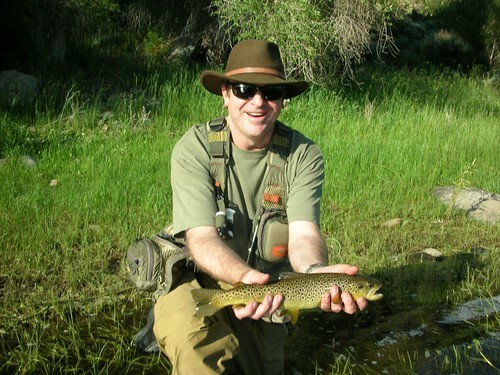 I went with a guide one day, which is when I got the nice rainbow on the Bigwood River in Sun Valley. Later that day we went to Silver Creek and boy was everyone right — tricky fish! 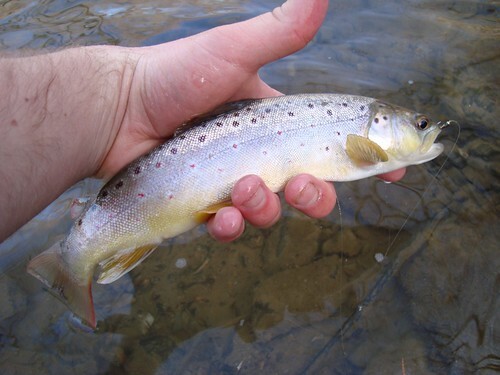 A few days later there was a brown drake hatch at Silver Creek, so I made my guide into my friend and he and I went out there to fish the hatch at dusk. I’ve never seen anything like it — there were so many anglers we had to wedge ourselves into the river, (as you can kind of see in the pic). And all fishing etiquette went out the window! We drank some beers and stayed until about midnight fishing the caddis hatch by the light of the full moon, which was truly one of the coolest things I’ve done recently. The only way I knew my friend was still out there on the river with me was the occasional sound of his line whistling in the still night air; the only way to know the fish were there was to listen for their slurp and splash in the darkness. I had one really good bite but didn’t set my hook fast enough. Definitely need to work on that for next time as those Silver Creek fish don’t give you a second chance. Theaux, you and Rocky should know that my guide complimented me on my skills, which I owe to you guys. Thanks to Backwater Angler, I was able to get into a river crowded with major anglers and hold my own! This entry was posted in fishing report on June 23, 2008 by Alex McCrickard. I fished the river last Monday for the majority of the day. I fished in the Upper Catch and Release section and started at around 8 in the morning. 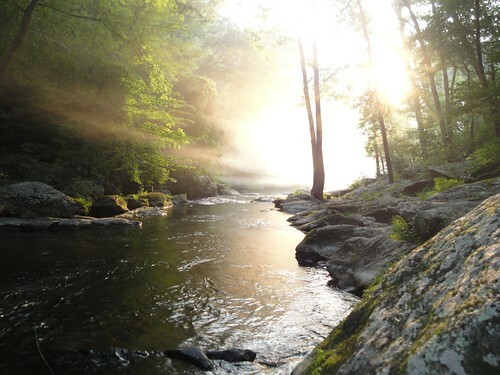 As sunlight seeped through the trees and reflected over the water, the Gunpowder River seemed to be an excellent place to be prospecting for wild brown trout. All morning, Caddis were sporadically coming off in size #16 as the sun warmed the water. I saw many midges in sizes #20-24 hatching in the riffle water. Lots of midges were clouding up together over back eddies and flats, dancing above the water. I skated a size #16 tan Elk Hair Caddis through the riffle water in front of me, which accounted for a few browns. As I worked my way through the riffles, I switched to nymphing. I fished a size #14 bead head Pheasant Tail nymph with a smaller Hare’s Ear nymph as a dropper. I attached a small split shot above the Hare’s Ear nymph to attain more depth. I added a stick-on indicator four feet above the Pheasant Tail nymph on my 9ft 6x leader. I worked my way up the riffle and picked up many fish on the smaller hare’s ear nymph. 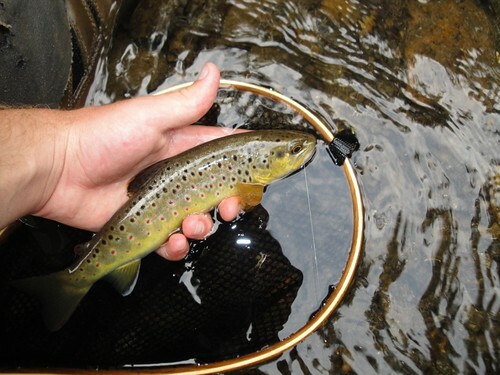 The average fish was a chunky 8 to 11 inch brown trout eager to take a fly. 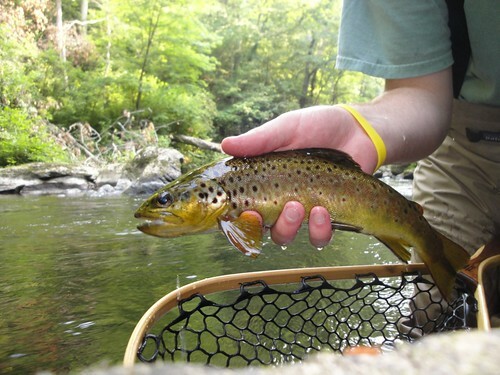 The nymphing was a ton of fun and I was filled with euphoria every time my indicator shot underneath the surface as I found myself tight to another Gunpowder River brown trout. I fished hard throughout the morning and into the afternoon. Early in the afternoon I ran into Gunpowder River Guide, Bill Wolf. At this point in the day, sulphurs were coming off here and there. The bugs were in sizes #16 and #18. It was a light hatch as the bugs were not incredibly thick. However, Bill and I scanned the flat water and saw a trout nose or two breaking the surface. We worked the water together and fished Comparadun patterns and CDC emergers. We were able to fool a few fish that were rising and it was satisfying getting some surface action. I consistently caught fish throughout the entire day. The fish of the day was a nice rainbow I caught in the morning. Stop in by the shop and we’ll recommend some effective patterns. The river is fishing well so wet a line! This entry was posted in fishing report on June 14, 2008 by Alex McCrickard. Earlier this month, my Dad and I were lucky enough to spend a morning fishing the East Gallatin River, about five minutes away from the Bozeman airport in Montana. 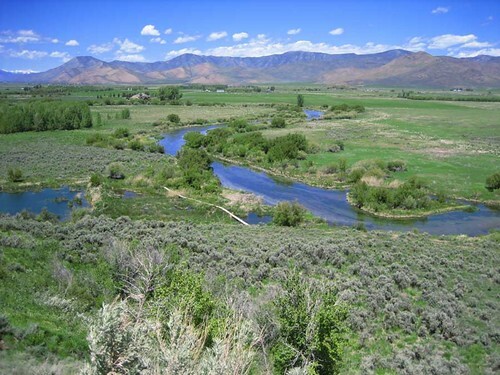 The East Gallatin is not a raging western river by any standards but is considered a small stream as it is only a tributary to the larger and well known Gallatin River. The East Gallatin is mostly made up of deep bending pools with long undercut banks. 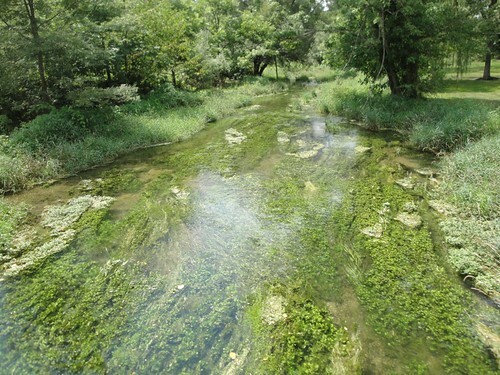 In between many of the larger pools are small riffles and flats, which provide great feeding grounds for eager trout. 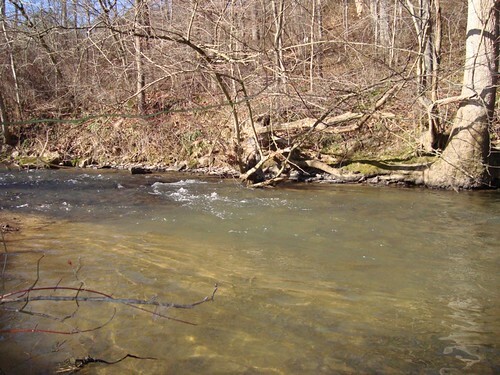 The East Gallatin is home to wild brown and rainbow trout. 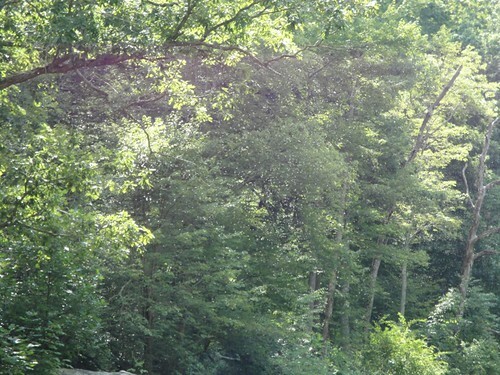 We fished the river at the access point where Milesnick Spring Creek runs in. On the morning we fished the river, many insects were out and about. A few caddis were hatching in size #14-16. We came across terrestrials including large hoppers, beetles, and ants. The trico hatch was tremendous, starting around 10 a.m., as bugs were grouped in massive amounts over the flats and riffles. My Dad and I had some success nymphing deep with small patterns before the tricos really started hatching. I was fishing with a size #20 bead head PT nymph dropped below a larger size #12 bead head prince nymph. I had one small split shot above the prince nymph and then one indicator about 4 feet up. This rig accounted for a few fish before the hatch started, all on the small PT nymph. Once the hatch started, I was able to pick up a few more fish on the surface using small trico comparaduns in size #20.The fish of the day was this 23 inch brown trout that I caught on the size #20 bead head PT nymph. This fish put up a great fight and I was shocked to land it on 5X. All in all it was a very memorable morning. This entry was posted in fishing report on September 4, 2007 by Alex McCrickard.